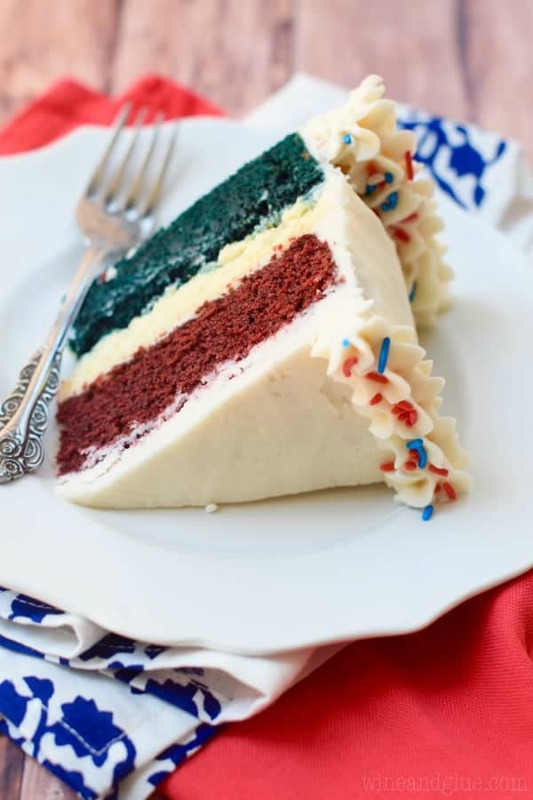 This Red, White, & Blue Velvet Cheesecake Cake is not just a huge show stopper, it is amazingly delicious! Two red velvet layers sandwich an amazing cheesecake layer, all covered in the most delicious vanilla buttercream frosting! I have a ridiculously crazy cake for you guys today. Okay. If you are a cake stalker on the internet, you are wondering why I am so worked up about a three colored cake. That’s fair. But it’s ridiculously crazy for me! I’m a layered cake newbie . . . and you guys. This cake is THREE layers. And one of them is cheesecake! Okay, lets talk about this cake a little bit. 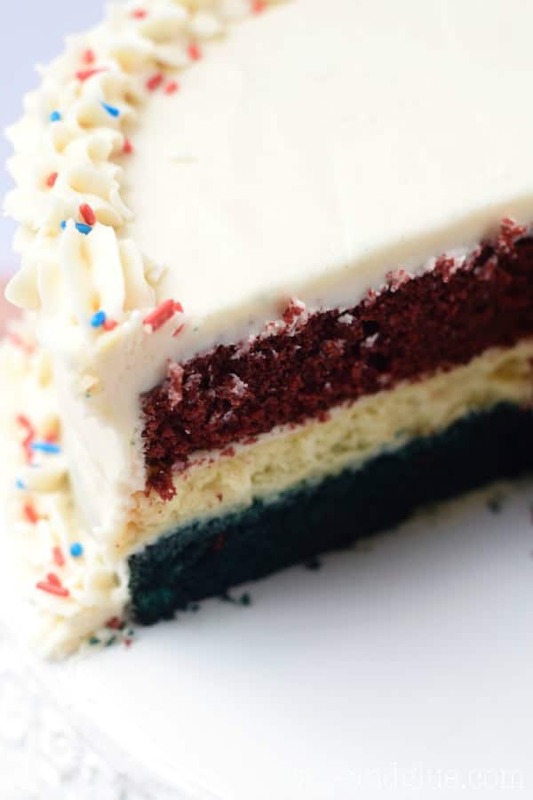 The top and bottom layer are a delicious red velvet, with the cake batter being divided into two bowls and then the red food coloring being added to one and the blue food coloring being added to another. Now. I know that there are people out there with really strong opinions about food coloring. I have never experienced any problems with it and neither have my kids, so I’m good with it. If you struggle, I know there are alternatives out there, so I encourage you to find a recipe that uses one of them. Should we talk about the cheesecake? I’m pretty sure that I am never going to eat another layered cake again that doesn’t have a layer of cheesecake shoved in the middle. Put the bottom of the springform pan on some parchment paper and trace it, cutting out a circle. Put the circle in the bottom of the pan. When you make your cheesecake batter, the cream cheese and the eggs absolutely have to be at room temperature. Do not overbeat your batter, it will form air pockets in your cheesecake and make it cook less evenly and be less pretty when you cut into the layered cake. Let your cheesecake first cool in the turned off oven after baking and then on the stove top before finally being transferred to the freezer and freezing overnight. When you construct your cake, simply pop open the springform pan, peel off the parchment paper and pop it in there. You may need to trim your cheesecake a little if the edges stick out over the bottom blue layer. Finally, make sure you refrigerate this cake, otherwise the cheesecake layer with change in thickness and that will funk up your pretty buttercream frosting job. 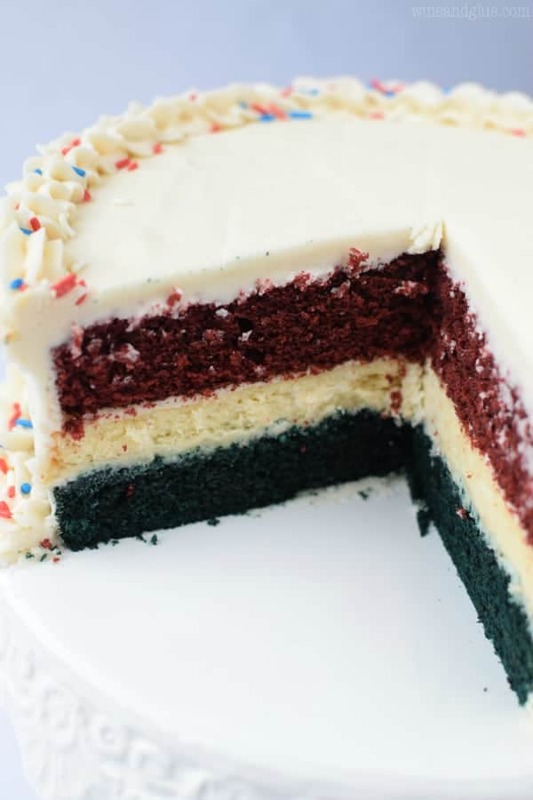 To make the Red/Blue Velvet Cake: Preheat the oven to 350 degrees. Prepare two 9 inch cake pans by spraying them with cooking spray. In a large bowl, mix together the flour, cocoa powder, baking soda and salt. Set aside. Beat together the butter and sugar, until light and fluffy. About five minutes. Beat in one egg at a time. Then the vanilla, buttermilk, oil and vinegar until just combined, be careful not to over mix. With the mixer on low speed, slowly add the flour/cocoa mixture a 1/2 cup at a time until just combined. Divide the cake batter into two bowls evenly (I weighed my bowls to make sure they were even.) Mix the blue food coloring into one bowl and the red food coloring into the other bowl. 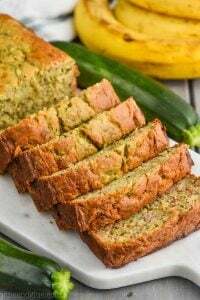 Pour the batter into the pans and bake for 25 to 30 minutes until a toothpick inserted in the middle of the pan comes out with just a few crumbs. Allow cakes to cool in their pans for about a half hour before transferring to a cool rack. Once completely cool, store in an airtight container until the cake is ready to assemble. To make the cheesecake: Preheat the oven to 350 degrees. Spray a 9 inch springform pan with cooking spray. Cut a circle piece of parchment paper and place at the bottom of the pan. Pour the batter and cook for 30 minutes. Turn off the oven and let the cheesecake rest for an hour. Remove from the oven and allow the cheesecake to cool completely. Cover the entire pan with plastic wrap and freeze overnight. 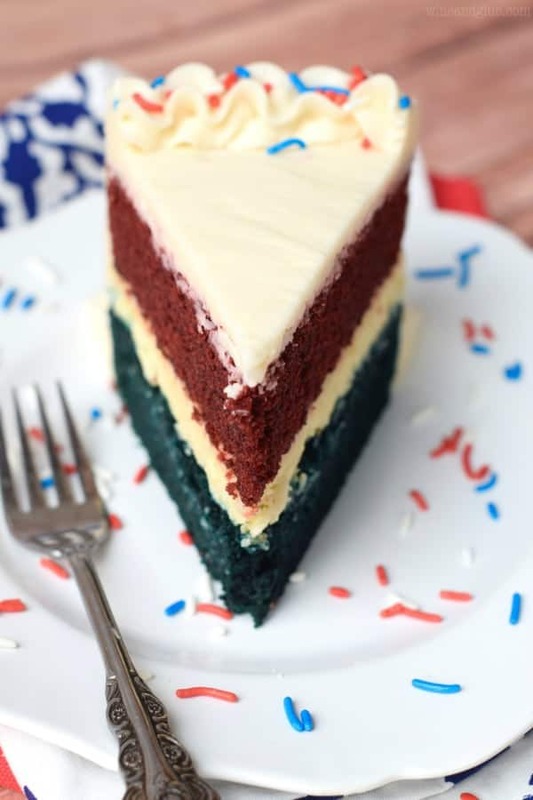 To assemble the cake: With a searated knife, level the blue and red layers. Put a small dollop of frosting the cake stand. Add the blue layer. Put frosting in a half cup measuring cup and add to the top of the blue layer. Remove the cheesecake from the freezer. Take it out of the spring form pan and peel off the parchment paper. Put it on top of the blue layer. 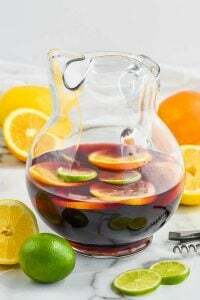 Trim the top so it is level and the sides so it is flush with the blue layer (if necessary). Spread on a half cup of frosting. Add the red layer. Add a half cup of frosting to the top of the cake and about 3/4 cup of frosting to the sides to make a thin crumb coat. Allow the crumb coat to fully dry, about an hour. Once the crumb coat is dry, add the remaining frosting to the cake with a large angled icing spatula , carefully and evenly spreading it on. There should be enough left over to add some piping to the bottom and top of the cake. 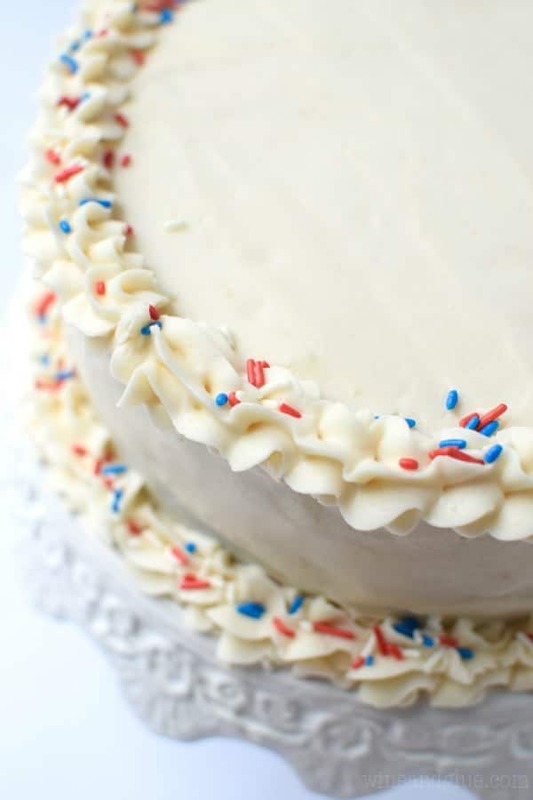 Quickly add some red, white, and blue sprinkles. Refrigerate the cake and serve within two days. I find that cutting a stick of butter into 1 inch pieces and leaving it on the counter for a half hour is a great way to bring it to room temperature fast. You should be able to easily push your finger into the butter without it going all the way through. So THIS is what you did with that awesome buttercream! Well played, Lisa. Stay excited about the multicolored cake. Anyone who doesn’t feel instantly happy looking at this is just jaded and sad. It’s super! It’s SO gorgeous!! Oh my gosh I wish I had a slice right now. Cheesecake with cake and more cake? Sign me up!! This is absolutely stunning!!!! I love the hidden surprise of the colored layers…and cheesecake!!! Holy cow! This would be perfect for the 4th of July. But I have a question: how much vanilla in the cake layers? Thanks! Good catch Cheryl! I just KNEW I was going to miss something in this recipe, there are so many pieces to it. 2 tsps. Updating now. Thank you for catching it! I WANT THIS CAKE!!! That is all. I’ve never had a cheesecake cake but but your pictures are making crave cake! I bet if you made these and sold them you would get rich 🙂 I sure would buy one…. 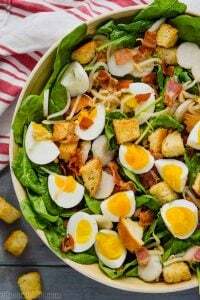 I am a new follower and just checked out your recipes and you have some great ones here….. 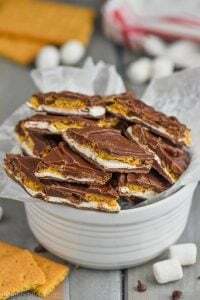 I am looking for a real good Pecan bar recipe…..I love any kind of bar cookies…..